It doesn’t take a whole lot to make us happy, especially when it comes to food. Sometimes, the simplest combinations are all it takes for us to swoon over a meal. Lemon and honey make us happy. Together they are so sweet and cheery, and when paired with soy sauce they create an out-of-this-world flavor combination that rocks our tastebuds, and that’s why we absolutely love this recipe! This chicken is also awesome because even though it’s loaded with flavor, it’s sautéed, not fried, making it much more waistline friendly than the kind you’d get from Chinese takeout. We let the meat marinate overnight so it’s extra flavorful, but actual prep and cook time is only about 20 minutes – how awesome is that?! 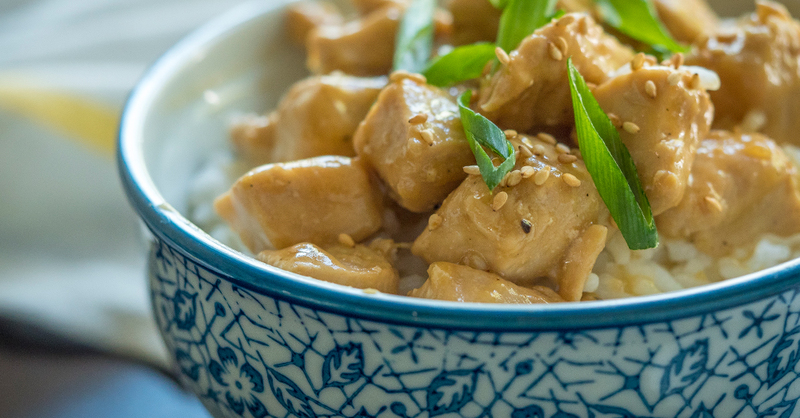 Try this fuss-free, healthy chicken dish the next time you’re craving an Asian-inspired meal, we know you’ll love it too! In a large, resealable plastic bag, combine soy sauce, white wine vinegar, garlic and chicken cubes. Seal bag and shake so all chicken pieces are evenly coated. Place in refrigerator and chill for 2-8 hours, or overnight. Remove chicken from marinade and season generously with salt and pepper. Heat olive oil in a large pan or skillet over medium-high heat and brown chicken on all sides until cooked through, 6-8 minutes. Transfer chicken to a separate plate and set aside. In a small bowl, whisk together chicken stock, honey and lemon juice. Sprinkle in cornstarch and whisk until smooth. Season with ginger, salt and pepper, and taste and adjust seasoning, if necessary. Pour sauce mixture into skillet (use the same one you cooked the chicken in) and return to medium-high heat. Bring mixture to a boil and cook for 3-5 minutes, or until thickened. Once desired thickness is reached, return chicken to pan and toss to coat. Serve hot with rice and your choice of garnish. Enjoy!